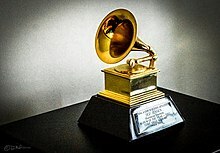 ^ "See The Full List Of 60th GRAMMY Nominees". GRAMMY.com. November 27, 2017. Retrieved December 08, 2017. ^ "The Internet Is Calling Out the Grammys With #GrammysSoMale". Time. Retrieved April 06, 2018. ^ "Ariana Grande slams Grammys producer and accuses him of lying". CBS News. Retrieved February 08, 2019.